Holy Trinity works in various ways to help provide affordable housing for our community. The congregation has developed two apartment buildings on church property. Trinity Apartments was built in 1978, providing 120 units of affordable housing. 25 years later, construction began on Trinity-on-Lake, a “mixed use” building, that now rents 8 units at market rate, 8 units as affordable housing, and 8 units reserved for persons with special needs. 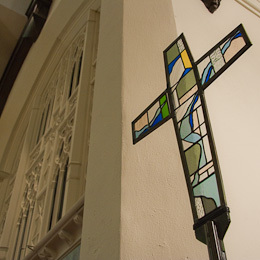 Holy Trinity also is a member of the Metropolitan Interfaith Coalition for Affordable Housing (MICAH) and has worked on over 25 homes for Habitat for Humanity. In 2010, Holy Trinity members took a Habitat for Humanity trip to El Salvador. The Metropolitan Interfaith Council of Affordable Housing is dedicated to the vision that everyone in the Twin Cities metropolitan community has a decent, safe, and affordable place to live. The congregation regularly serves meals, does Bible studies, and other activities at this site.